While the North Eastern Pacific weather settles nicely, the team is putting the finishing touches to Pegasus 50. We could have a fast race. The record is a possibility. It may be windy. Preparation is all the more important. Now we must make sure that all systems are a go. This is a very advanced and complex boat. There are a lot of systems to check: we have a canting keel, 6 separate water ballast tanks, two rudders, two moving dagger board foils, duplicate wireless networking systems, two satellite communications systems… it goes on and on. For optimal speed, doing a last minute thorough bottom clean is a big plus. At the same time we verify the integrity of the canting keel mechanism and all the movable foils. This picture shows how polished our bottom is before she re-enters the water. 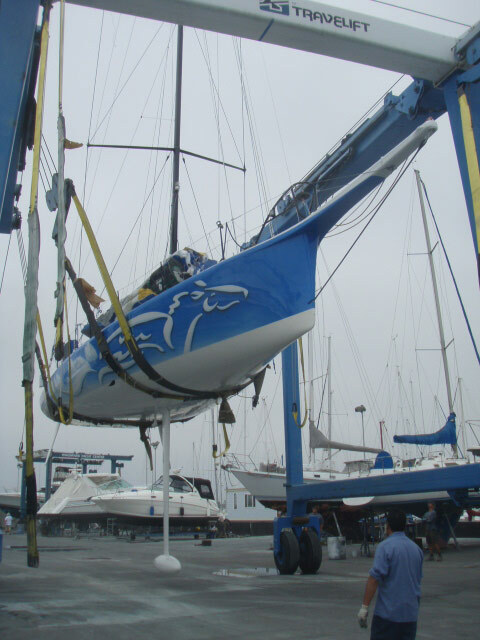 Pegasus 50 is now back in the water. Personally I am spending the day working here in Santa Cruz. Crusty is in Long Beach unloading everything from the boat, cleaning everything out, and then reloading everything very carefully – right down to the forks and spoons. Our sailor’s food gets loaded at the last moment. It’s all frozen in dry iced day-boxes. Right now our frozen food is sitting in a rented freezer in Long Beach. Because there are only two of us sailing, the logistics are that much more important. Any preparation before the start of the race pays immense dividends during the race when we are so busy sailing the boat, just the two of us. Tomorrow we get to go for the last minute shopping items. Crusty needs a pair of sandals and I need a different hat. Important details. I will fly my plane to Long Beach late tonight after work. It’s just an hour’s flight.